We added the 360 to the name, "Custom Apps 360, LLC" because it represents many different facets how our company looks at custom programming. How we can incorporate every software application within your network and bridge them all together to create a "One Write System" with "No Double Entry Work". How many different programming technologies, no matter how fast the world turns, always seem to come back to the basic operations for why we need and use computers to begin with. Programmed correctly, computers and smart devices make our lives easier and help us communicate with one another much faster. This has been the goal from the very beginning. And, although the tools for programming have changed, the devopment cycle has not and the fundamental instruction set of arithmetic and logic commands still hold true today. 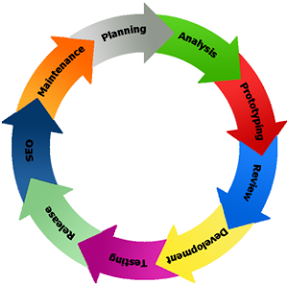 How many businesses seem to cycle and perform daily or weekly or periodic tasks that start where the last task ended. How properly designing a custom application is knowing where it starts and what the goal is and the steps in between to get there. We are a "Boutique Shop". We examine your business and discuss what you have, what you want connected, and where you want to end up. Once the project starts, a new circle is drawn. The code starts out with security considerations or "Who has access to What?". Then, we discuss data considerations and where original data comes from and what new data, if any, has to be stored. This is to help prevent "Double Entry" work which always leads to data quality issues. Then is a series of coding, testing, and fine tuning. Then the notification system. The last part, the notification system, has turned into a tremendous time saver for everyone. Sometimes, you may not realize that your applications aren't even working. Thinking "No News is Good News" sometimes leads to a loss of business. We like to send basic tally or totals information in the form of an email or text on a regular basis. The reasoning is that you know your business and you probably know the numbers. So, if those numbers are off or, you are not seeing traffic when you know there should be, we can mitigate the damage of an application not working properly or not working at all.